The Boulder City golf program was heavily represented during the Division I-A award announcements last week, with all five of the Lady Eagles golfers receiving their share of All-League honors and sophomore Lani Potter named the Division I-A Southern Region Player of the Year. Potter also was named a member of the All-Southern Region first team, representing the top six golfers in Southern Nevada. Earning five first-place finishes during the season for the Lady Eagles, Potter guided Boulder City throughout the Division I-A Sunrise conference and into its first state tournament appearance since 2010. 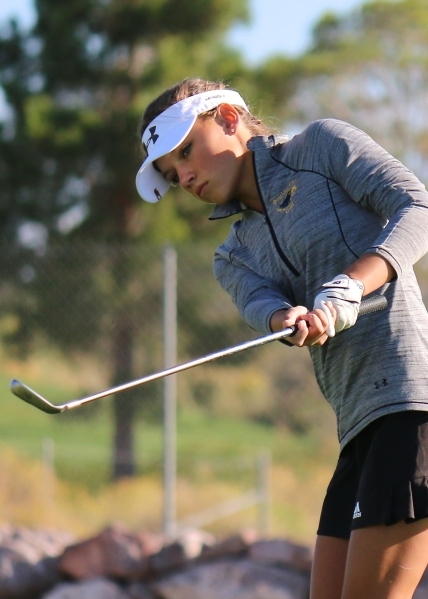 Also claiming a top-three finish in the Lady Eagles’ meet with Division I-A opponents Coronado and Green Valley, Potter capped off her season with a second-place finish in the Division I-A state meet with an overall score of 149. Along with her All-Southern Region honors, Potter was named to the All-Sunrise League first team. Joining Potter in the All-Southern Region honors discussion was freshman Madisan Walker, who was one of six golfers to make the second team. Giving the Lady Eagles a reliable second option behind Potter, Walker gave Boulder City three top-five finishes (second and two fourths), as well as a pair of sixth-place efforts. Concluding the Division I-A Southern Region tournament with a 13th-place finish with a score of 104, Walker then showed great effort at the state meet with a 17th-place finish, 10th amongst Southern Nevada golfers, with an overall score of 205. For her efforts, Walker was also named a member of the All-Sunrise League first team. Earning All-League honors as well for the Lady Eagles were juniors Lauryn Norris and Holly Piper, along with freshman Ryann Reese. Norris, a first-team selection, not only provided the youthful Lady Eagles with valued leadership as the team’s only upperclassman, but reliable scores as well. Posting three top-five finishes (a fourth and two fifths), as well as a ninth-place finish during the regular season, Norris capped off her season with a 36th-place finish at the Division I-A state meet with an overall score of 232, after placing 14th at regionals with a score of 112. Both newcomers Reese and Piper would earn second-team All-Sunrise League honors, giving the Lady Eagles a solid five-player rotation. Steadily improving each week to make the nine-hole cut, both improved tremendously toward the conclusion of the season, finishing 42nd and 45th overall at the state meet. — Contact Robert Vendettoli at BCRsports@gmail.com.